Harrold Independent School District was the first of many Texas districts — mostly in rural or isolated areas — to arm educators and other employees to prevent a potential school shooting. 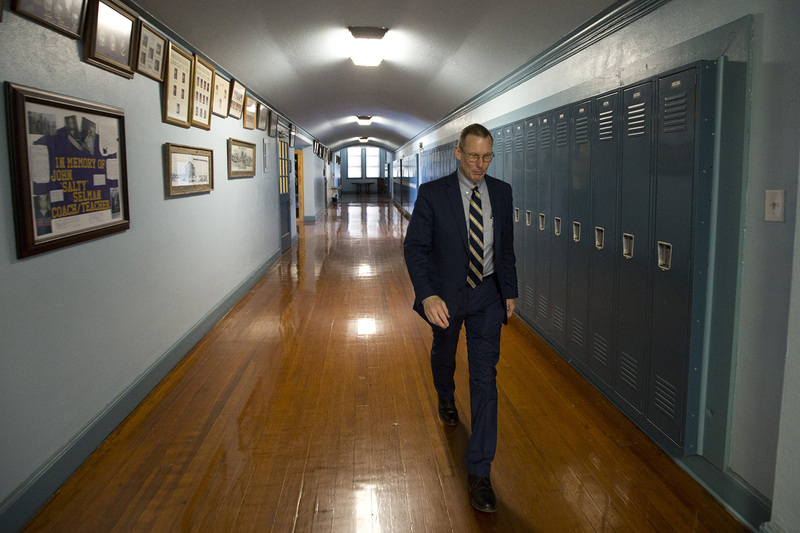 "I don't want to be anybody's victim," the school's superintendent says. HARROLD — All of Harrold Independent School District is packed into a two-story red brick building that sits off U.S. Highway 287, nestled among windmills, a water tower and farmland. The district serves kids from a 200-square-mile area in Wilbarger County near the Texas-Oklahoma border. Everyone knows everyone in this rural district with 24 employees and 115 students, about 100 of whom commute from other towns. It takes the county sheriff’s department about 15 minutes to respond to the average emergency call. So to close that gap, Superintendent David Thweatt created a plan in 2007 to arm certain staff members, including teachers and administrators. “We take care of ourselves," Thweatt said. "I don't want to be anybody's victim." 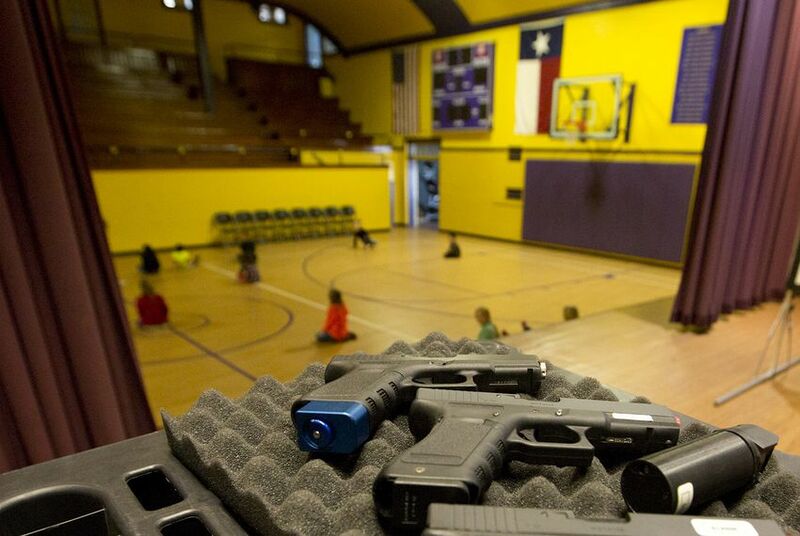 Harrold ISD was the first of more than 170 Texas school districts — mostly in rural or isolated areas — to arm educators and other employees to prevent a possible tragedy. So far, Thweatt said, the armed employees in his district haven’t had to pull their guns. But since the Feb. 14 shooting at Marjory Stoneman Douglas High School in Parkland, Florida, in which 17 people died, districts with such a policy have come under national scrutiny as more politicians have pushed for arming teachers or other school personnel. Critics argue that allowing guns in schools makes students and staff less safe and adds another burden on schools. But proponents say it helps districts more quickly respond to active shooter situations, and the chosen employees often have to pass psychological or shooting tests. Texas schools have two options if they want to arm staff members: The Guardian Plan allows local school boards to determine training standards and authorize specific employees to carry on campus at all times. The school marshal program also allows local boards to authorize employees, but they must be specially trained and licensed by the Texas Commission on Law Enforcement, which oversees the program. Under the marshal program, they can't carry firearms around students. Both programs require anonymity — only select officials can know who is armed in a school district — and both allow districts to offer armed employees a monetary stipend. About 10 years ago, following the 2006 Pennsylvania Amish schoolhouse shooting that left five dead and the 2007 Virginia Tech shooting that left more than 30 dead, Thweatt created the Guardian Plan, fearing a similar incident could happen in Harrold. Thweatt wrote the policy, got school board members’ approval and had a team of attorneys look over the proposal to ensure it didn’t violate state or federal law. After Harrold ISD began arming employees, Thweatt shared what they had done with the Texas Association of School Boards, which compiles school district policies, and the idea began to spread. Harrold ISD employees chosen to carry at school go through at least 15 hours of training that includes videos of hostage scenarios and shooting drills. Thweatt said he uses his own judgment to determine whether an employee is a good candidate for such a potentially deadly responsibility. “There’s no one on the Guardian team that I haven’t worked closely with for at least three or four years,” he said. The Guardian Plan began receiving more attention from other school districts after the 2012 shooting at Sandy Hook Elementary School in Connecticut, which left 28 dead — including 20 children and the shooter. Texas Association of School Boards spokesperson Barbara Williams said at least 172 Texas districts have adopted the Guardian Plan. Because no state agency has responsibility for the plan, local school boards set training standards and decide who is approved to carry concealed handguns on school property. At Fayetteville ISD, which adopted the plan in February, and Keene ISD, which adopted it in 2016, superintendents Jeff Harvey and Ricky Stephens said every armed employee in their districts has to take a mandatory psychological test administered by an outside party. While Fayetteville ISD doesn’t require a specific amount of firearms training, Harvey said most staff members do around 20 hours per year — which can include going to a shooting range. Keene ISD goes a step further, Stephens said, requiring 80 hours of initial training and 40 hours annually after that. 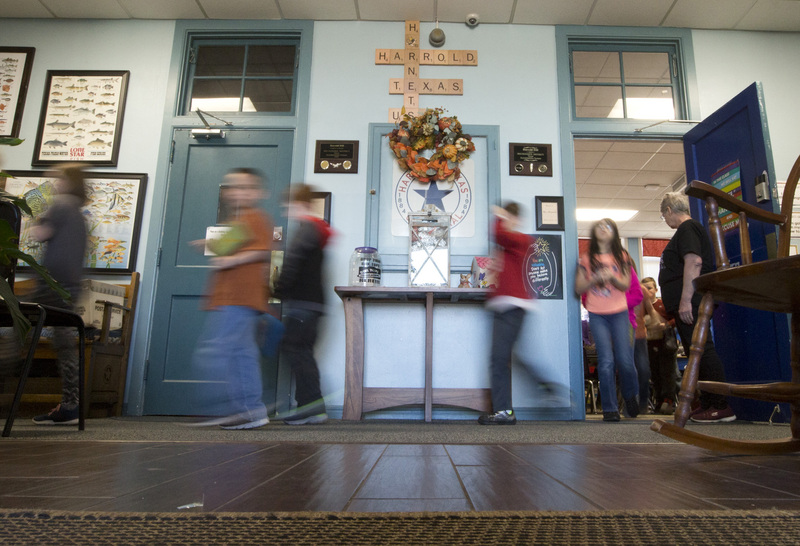 After the Sandy Hook shooting — and amid mounting criticism that the Guardian Plan didn’t require police-style training — the Legislature passed the Protection of Texas Children Act in 2013. The bill, authored by state Rep. Jason Villalba, R-Dallas, created the school marshal program — which President Donald Trump praised during a meeting of governors at the White House after the Parkland shooting. Districts with school marshals are regulated by the Texas Commission on Law Enforcement, which develops the 80-hour police-style training employees take every two years. The training includes a mental health evaluation and firearms proficiency requirements. Schools can designate one marshal for every 400 students or one per building. Unlike guardians, marshals aren’t allowed to carry guns around students and have to keep them in a lockbox. Although the Texas Commission on Law Enforcement would not release the number of districts with marshals, saying it’s confidential information, Villalba told Politico in February that he believes it is greater than 20 but fewer than 50. One of these districts is Wylie ISD, located in Taylor County. Although experts said there has been increased interest among Texas school districts in arming educators since the Parkland shooting, that hasn’t translated into a spike in districts actually adopting one of the programs. And some still doubt their effectiveness. Robison pointed to other safety options districts can use, such as hiring school resource officers — government-employed peace officers placed at schools — or creating their own police departments. According to the Texas Association of School Boards, about 150 districts have their own police departments and more than 250 districts use school resource officers instead. Still, Robison said, those options can be too expensive for smaller districts. Dallas ISD Police Chief Craig Miller, who spent 30 years in the city’s police department before joining the district in 2011, told The Dallas Morning News in February that it’s difficult for even veteran officers to react perfectly during a shooting — and to recover psychologically after firing at someone. Miller said he saw the benefit of school marshals in rural communities, but he’s also reluctant to encourage more educators to carry guns into schools. "One thing that people lose sight of in these shootings is that it takes place in the blink of your eye," Miller told the newspaper. "Even with a school administrator down another hall armed, they may not be able to get there in time to do something." That debate doesn’t seem to be giving people second thoughts in Harrold ISD, where many community members are privately licensed to carry and hunting is popular. Parent Grace White, who graduated from Harrold ISD in 1994, lives 20 minutes away in Vernon and has two teenagers in the district. She said she doesn’t remember any backlash when the district’s policy was first initiated because people trusted Thweatt’s decision. And with every school shooting since 2007, including the one in Parkland, White said support for arming their educators has only grown. Disclosure: The Texas Association of School Boards and the Texas State Teachers Association have been financial supporters of The Texas Tribune, a nonprofit, nonpartisan news organization that is funded in part by donations from members, foundations and corporate sponsors. Financial supporters play no role in the Tribune's journalism. Find a complete list of them here.